Download a free trial version of the VOLANO chat software from the links below. The contents of the .zip and .tar.gz archive files below are identical except for the newline characters of the text files. The .zip archives contain text files with end-of-line markers for Windows systems (CR+LF), while the .tar.gz archives contain text files with end-of-line markers for Unix-like systems (LF). the trial full version 2.13 package for Microsoft Windows operating systems. the trial full version 2.13 package for Unix-like operating systems such as FreeBSD, Linux, Mac OS X, or Solaris. the upgrade to trial version 2.13 from version 2.12 for Microsoft Windows operating systems. the upgrade to trial version 2.13 from version 2.12 for Unix-like operating systems such as FreeBSD, Linux, Mac OS X, or Solaris. the MD5 message digests for verifying the downloaded files. Note: The links above are trial versions of the software that allow applet connections only to the local host computer (localhost or ip6-localhost). This update of the VOLANO chat server no longer requires a license key. Instead of a server license key, version 2.13 uses the Codebase attribute of the Java archive file manifests to restrict the distribution of the VOLANO applets by host name or domain name. With this update, you no longer need a new license key when your server IP address changes after simply moving the VOLANO chat server from one host computer to another. Note that you can also provide a list which restricts the Web pages that can embed the VOLANO applets from your server, or you can leave the server open and allow any Web site to embed your applets on their pages. 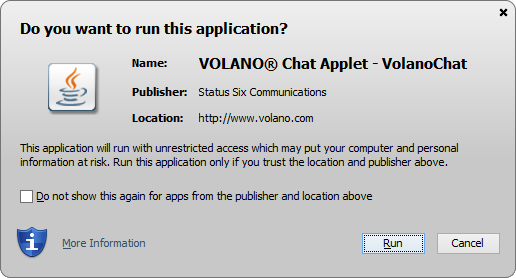 As with the previous version 2.12, the VOLANO chat applets require Java Plug-in Version 7 or later to be installed on your visitors' computers, available for download at www.java.com. The VOLANO applets require one permission outside of the normal Java Plug-in sandbox to run on the Java 8 Plug-in. Specifically, they require a permission called SocketPermission to make the network socket connection back to the chat server. Because Java applets are unable to request specific permissions, the applets must request all-permissions to function on the Java 8 Plug-in. The Java security prompt now states, "This application will run with unrestricted access which may put your computer and personal information at risk." A sample prompt is shown below. The sizes of the signed applets are shown below in kilobytes for each of the three Java archive formats. Make the following changes to all of your HTML pages containing a VOLANO chat applet, such as the VolanoChat, MyVolanoChat, or WebVolanoChat applet. If you added the permissions parameter with the value sandbox to the applet elements on your Web pages for VOLANO version 2.12, you must remove it for VOLANO version 2.13. The permissions parameter value conflicts with the Permissions attribute value of the VOLANO 2.13 applet archive files. The VOLANO version 2.13 applets will work with either the Java 7 or Java 8 Plug-ins when the permissions parameter is removed from the applet elements. You should provide a notice to your visitors that the VOLANO applets require the Java Plug-in Version 7 or later to run, available from www.java.com. Download and unpack the archive file. Start the VOLANO chat server. Follow the steps below depending on whether you are installing the VOLANO chat server on a Unix-like system or a Windows system. Go to the address http://localhost:8080/vcclient/ on the same machine running the VOLANO chat server to connect to the server with the VOLANO chat applets. See the documentation for details about starting the VOLANO chat server as a Windows Service to avoid the Command Prompt altogether. Stop the VOLANO chat server. Save a backup copy of the version 2.12 code. Follow the steps below depending on whether you are applying the upgrade on a Unix-like system or a Windows system. Download the volano-upgrade-2.13.0-localhost.tar.gz file and unpack it into the existing VOLANO chat server version 2.12 installation directory. The -m option updates the modification times of the extracted files to the current time so Web site visitors will be sure to pick up the new applet files instead of using copies of the old ones in their cache. Note: If you moved the public vcclient directory to your Web server root directory, you'll need to copy the new applet files there. Loading server properties from "/home/volano/volano-2.12.0/conf/properties.txt". www.example.com:8000 (192.168.1.1:8000) VolanoChatPro - unlimited connections. Note the updated VOLANO Chat Server Version number of 2.13.0. Download the volano-upgrade-2.13.0-localhost.zip file. Right-click the file and select Extract All... from the context menu. 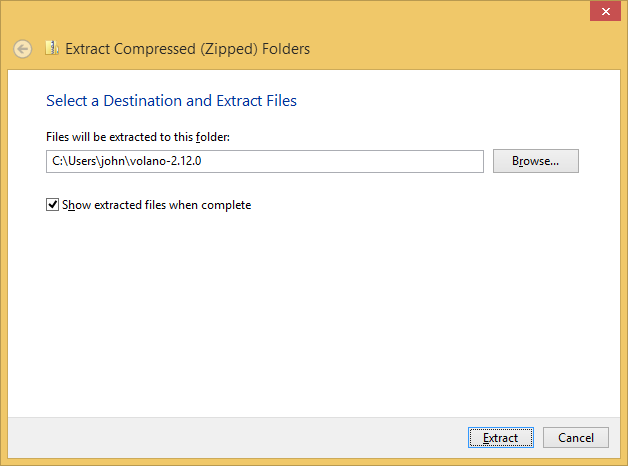 Follow the instructions and select the VOLANO chat server version 2.12 folder where you want the upgrade applied, as shown in the example below for the user john. 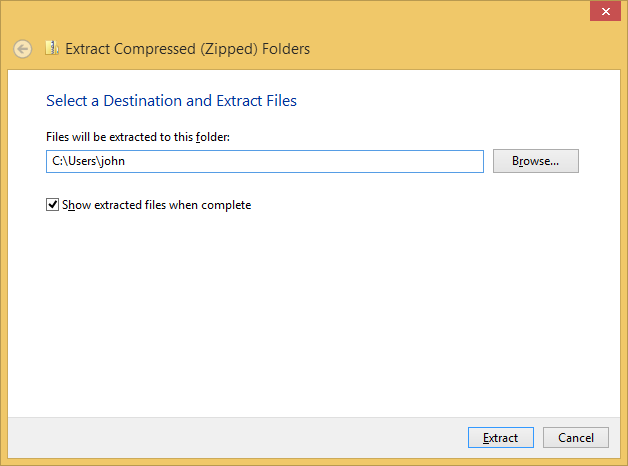 If you use a command-line unzip program to extract the files instead of the Windows Extraction Wizard, add the -DD command option. The -DD option of many unzip programs suppresses the timestamp restoration for all extracted files and directories, setting the timestamps to the current time. With current timestamps, your Web site visitors will be sure to pick up the new applet files instead of using copies of the old ones in their cache. Loading server properties from "C:\Users\volano\volano-2.12.0\conf\properties.txt". Copyright © 2015 Status Six Communications. VOLANO and STATUS:6 are registered trademarks of John Neffenger. ORACLE and JAVA are registered trademarks of Oracle and/or its affiliates. Check HTML, CSS.